Purple is a very stunning colour. They represent as royalty, luxury, and power. People who love purple may have that personality. If you love the purple colour, you may have a dream to have a purple bedroom. In this article, I will show you the ideas for this stunning purple bedroom. To see further, take a look at the list below. What if luxury and modern meet together? They may turn into this gorgeous bold purple! This design is very simple yet looks very luxury as well, the table lamps in the side of the bed make the atmosphere looks very modern. Well, purple represents power and maturity but you can also have the chic bedroom at the same time. 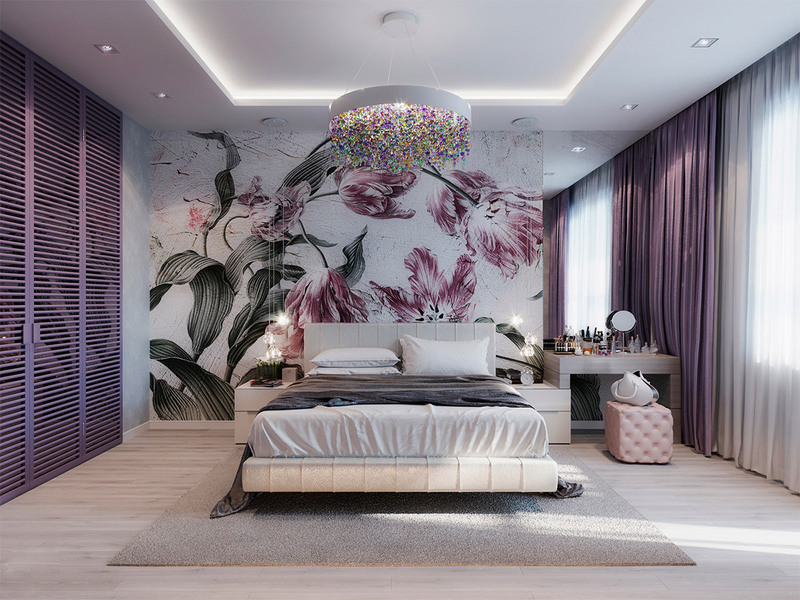 The floral wallpaper in the back of the bed is the brilliant idea to make your bedroom looks chic and the floral chandelier just make the vibe so much better! Bed canopy is very popular to decorate the bedroom. They use for not only make your room looks so much better but also it can warmer your sleeping area during the winter season. 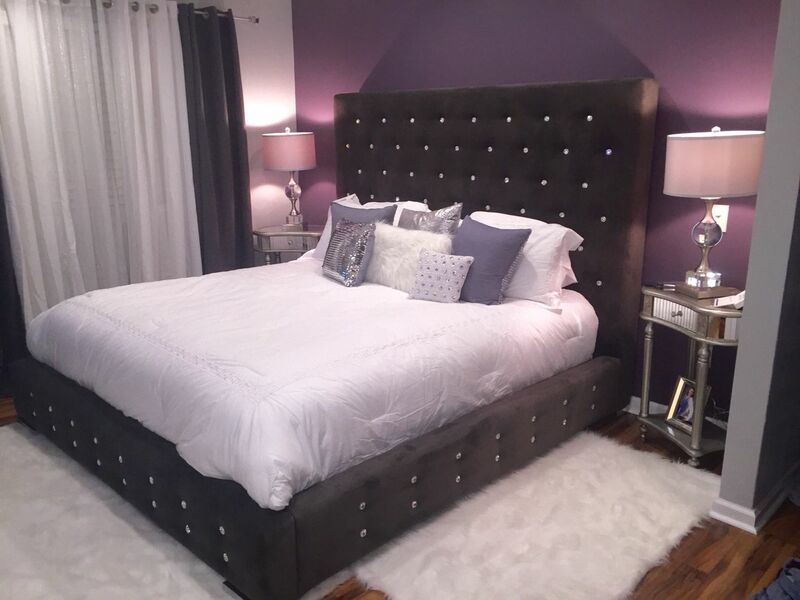 The bold purple like this brings the luxury vibe for your bedroom. It feels like you sleep in the royal bed, right? Teen girls who love the colour of purple may also love to have a purple bedroom. This coastal purple is suitable for teenage girls since soft purple brings the mood! You can also have your own project to make the curtain with net lights between your bed like this. All you need is white curtain and hooks for the ceiling and Christmas lights. 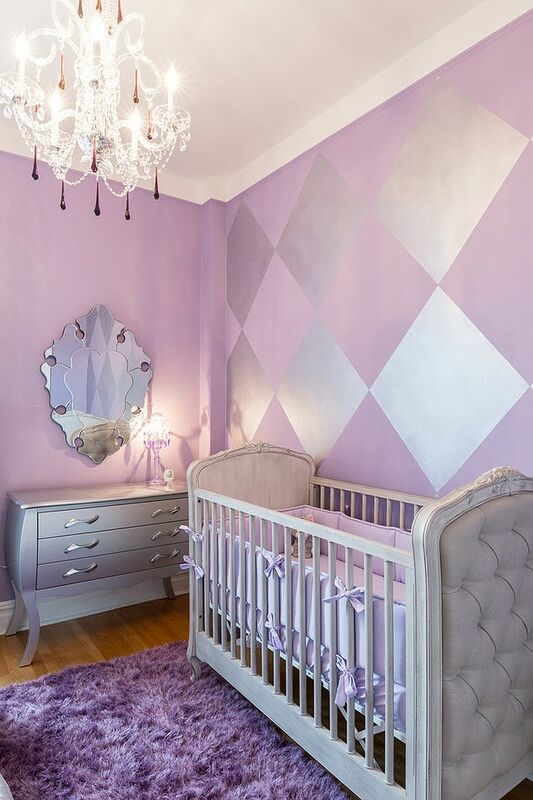 If you have a little girl that loves purple, you may want to give her favourite colour for her bedroom. This design is absolutely perfect! It is also a low budget bedroom. All you need is to paint the wall to pastel purple and get the handmade decoration for the plain wall. If you have a newborn baby girl and want to have the luxury nursery room for her, you may want to steal the inspiration from this picture. The chandelier, the bed, the dresser, and the mirror have the luxury style. Add the pattern for the wall to build the vibe. Use silver colour to give the extra luxury looks. The bunk bed for two children with dresser like this is an effective way to save more place and definitely suitable for the small room. Purple and pink are the two great combinations since both of them kind of look the same. If you love purple try to combine it with other colour to enhance the atmosphere and for your mood. Vintage style is literally the style that never dies. They always look stunning and gorgeous in their own way. Choose the purple wallpaper with a pattern related to vintage like shabby chic and etc. Who says that purple does not look good with black? This design is literally perfect. The combination of the white pattern brings the vibe even more. The design of purple bedroom may look fascinating but you may also wonder what kind of decoration that will make your purple bedroom so much better. In this part, I will show you the decoration for a purple bedroom that absolutely perfect. Take a look at the short list below. Ombre is the gradient of two colours. This ombre purple looks stunning and joyful also you can make this by yourself! All you need is a plain white curtain and dye the fabric. A bench is necessary for your spacious bedroom. This stunning purple velvet bench like this is available in the store and online store! Lamp table is essential for your bedroom lights. 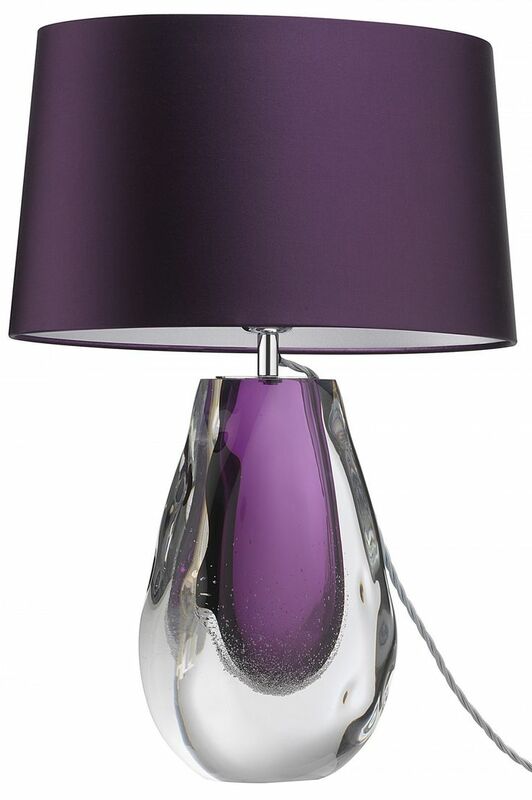 This purple lamp has the stunning colour and shapes for your modern bedroom. The colour of bold purple is just so stunning! Find the lamp table for your side table to complete the purple theme in your bedroom. Rugs enhance the mood in your bedroom. Choose the rugs that have a pattern with different colour as a contrast for your purple bedroom theme. The combination of three tones colour like this is one of the brilliant ideas you can get. Wall decoration is important for your bedroom as well. The plain wall of the bedroom can look so boring to look at without any decoration on it. The wall decoration is also can be one of your DIY projects, not only that you can be creative and have unique decoration but also this can save your budget even more. 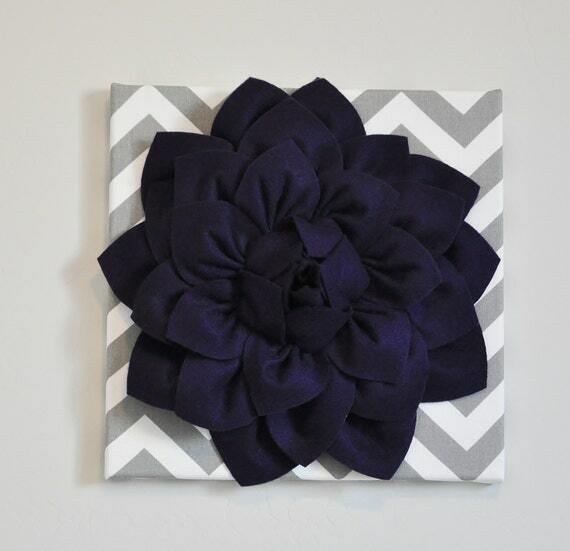 Choose a canvas frame to paint it and you can also glue a piece of fabric to give the eye-catching look. 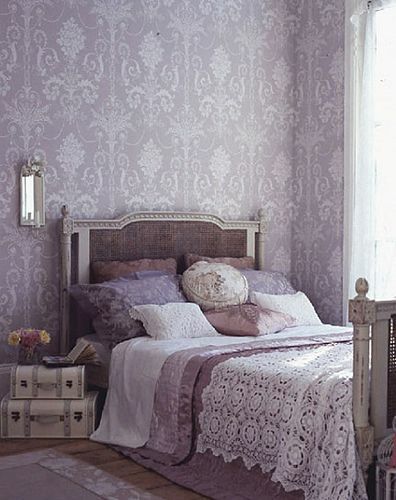 Vintage can also bring the stunning look into your purple bedroom. You do not have to buy a new mirror to make it looks elegant, thrift shop is absolutely fine to buy vintage stuff and you only need to paint them purple. That’s it! Another vintage furniture for your bedroom. This small dresser can also be turned into your side table. It has adorable shape and details! Absolutely perfect for your stunning purple bedroom. Vintage furniture like this you may easily found in the thrift shop. Purple chandelier always brings the luxury vibe into your purple bedroom. Have chandelier in your bedroom is necessary to achieve the luxury looks. Although they are not cheap, however, they are absolutely worth the money!